Extending the SkyTrain to UBC has become a hot topic recently with a renewed push by both the mayor of the City of Vancouver and UBC to extend the line. Currently, work is underway to extended the Millennium Line to Arbutus in Vancouver. Map of proposed UBC SkyTrain Extension Stations. Select map to enlarge. There were several options on the table that were being evaluated for the eventual connection of rail rapid transit to UBC from Arbutus.There were two surface light rail options, and a SkyTrain option. 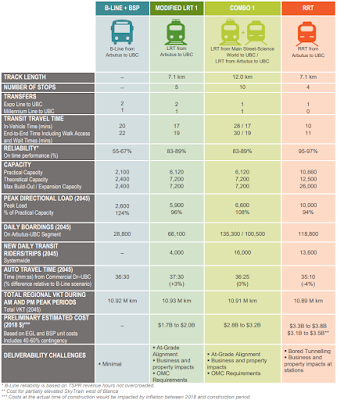 Last week, an updated technical report was released about the potential rail rapid transit options. The following table outlines the updated information about the options. Comparison table of B-Line, Light Rail, and SkyTrain (RRT). Select table to enlarge. What becomes clear pretty fast is that while SkyTrain costs about double the price of light rail, it would provide the best long-term value for transit service to the UBC campus. SkyTrain would cost about $3.8 billion to build, though if some sections where built at ground level in the less urban area, the cost could be reduced to $3.5 billion. While light rail would have more capacity than the current B-Line service, it would have very similar travel times. This is because it would be running at ground level, and would have to cross many intersections. SkyTrain would cut travel times in half for transit riders. The updated report also noted that light rail would be at capacity by 2045 while SkyTrain would still have room to grow. The following table shows the predicted peak westbound morning volume for the potential UBC SkyTrain extension in 2045. The red line represents the maximum SkyTrain capacity. Westbond AM peak SkyTrain demand in 2045. Select chart to enlarge. What stands out to me is the extremely low volume of passengers that would use the proposed Alma and Sasamat stations. I would hope that if a $3.8 billion SkyTrain extension is approved, the City of Vancouver would work hard to increase the housing options in those station areas. The final table shows how the report authors calculated the cost of building the UBC SkyTrain extension. Building SkyTrain to UBC is needed, but the challenge will be to come up with the funding. While UBC has committed to funding a portion of the project costs, the federal and provincial governments will also have to come to the table with significant financial commitments. One of the concerns that I have is that SkyTrain to UBC would push back building SkyTrain to Langley. The good news is that the dollars that the federal and provincial governments have currently committed to building rail transit in the South of Fraser can’t simply be reallocated to build SkyTrain to UBC. There is still a regional funding gap that needs to be plugged before SkyTrain can be built to Langley. The Mayors’ Council will have their work cut out for them to plug the gap to fund both proposed SkyTrain extensions in addition to other regional transit projects.